We know how big of an investment a stand up paddleboard is, and we want to make sure that our customers' investments are protected at all times when their SUPs aren't being used, so we are now offering a number of locking products to keep our customers' SUPs safe. We've got (1) SUP locks that lock directly to your paddleboard and we have (2) locking tie down straps for when your paddleboard is strapped to your roof. Check 'em out! SUP Lock - Dock Locks: this SUP lock is a lock that actually locks directly to your paddleboard with a cable cord that you then secure around an object, in the same way you would with a bike lock. The coiled cord comes with what looks like a "car key" that is the mechanism that locks to your SUP. The metal part of the "car key" opens up, which you then secure and set around your leash plug, effectively securing your SUP to the coiled cable. Then, you wrap the cable around a strong, nonmovable object, and lock the cable using a 4 number combination lock, and you're set! 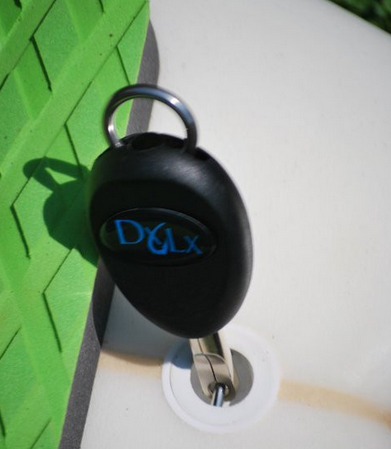 Since not all paddleboards have a leash plug, the lock comes with a fin box adapter so you can lock your board that way. SUP Locking Tie Down Straps: Thule is known for great storage products, and this locking tie down strap is no exception. The product at its core is a standard set of two tie down straps for use when strapping gear to the roof of your car, but with the added function that the release clamps for the straps have a lock so that the straps can't be undone with the key. This adds a serious level of security and deterrence to any would-be gear grabbers while you're traveling with your SUPs strapped to your roof and you stop to get some food, or check out a spot, or otherwise. The straps are each 13 feet long so have plenty of length. And really, you could use these straps to lock your paddleboards to your back porch, a fence, or other objects to keep them safe at all times. Enjoy!